Last week I had the HAP ladies over for an evening meeting. It has been a HOT summer here in Wisconsin and I wanted to serve something cold and refreshing that we could enjoy outdoors. I came across this Pineapple Chai recipe in my Fresh Home Magazine. It was the perfect recipe for a nonalcoholic summer cocktail. It becomes thick and frothy in the blender and is only slightly sweet. The black pepper is a surprising but perfect flavor booster. In a large pan, bring water and pineapple juice to a boil. Add the tea bags, reduce the heat and simmer for about 10 mins. Discard the tea bags and refrigerate the pineapple chai mixture overnight or until chilled. 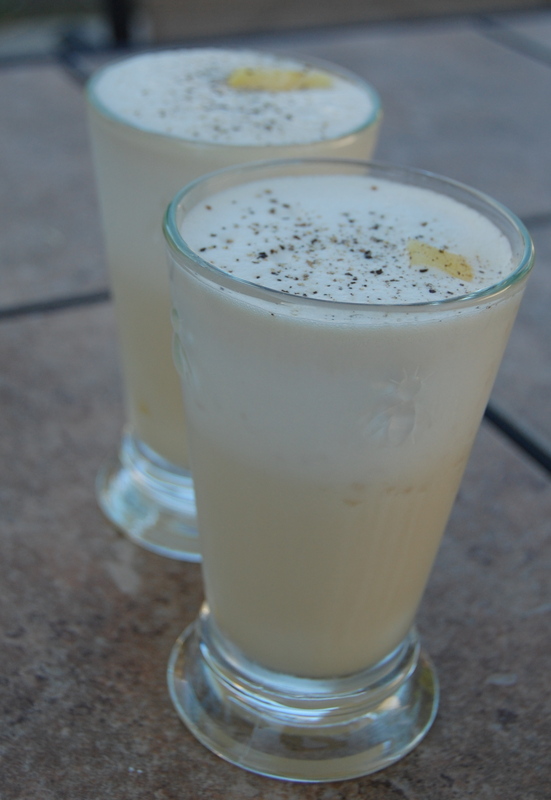 Place the pineapple chai mixture, ice, milk and honey in a blender. Blend until smooth. Pour into 4 glasses and top with freshly ground black pepper and a pineapple stir stick. That sounds delicious. I’ve never heard of Fresh Home but will have to check it out!